Ya devi sarbabhuteshshu, sakti rupena sanksthita Namasteshwai Namasteshwai Namasteshwai namo namaha - The Mahalaya Stotra broadcast through All India Radio and Doordarshan Television Channel during the early morning on Mahalaya from way back 1930's. Bengali's pride Birendra Krishna Bhadra could not be forgotten from our mind for creation of Bengali Devotional Mahalaya Radio Program, that people of all ages like most even in this era. Legendary narrator Birendra Krishna Bhadra has narrated the tale & story of Maa Durga through his magical voice. Mahalaya Mahisasur Mardini is a religious radio-audio drama of Birendra Krishna Bhadra. Script of Mahisasur Mardini Mahalaya written by Bani Kumar. 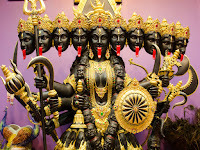 Narrator & Sung Mahalaya Mantra Mahisasura Mardini: - Birendra Krishna Bhadra. Mahalaya Mahisasura Mardini Music composer: - Pankaj Mullick. Famous singer Hemant Kumar and Arati Mukherjee also sung the historical devotional song Mahisasur Mardini Of Mahalaya, but the Birendra Krishna Bhadra's Mahalaya Song is really can't be copied and will be immortal. Copy and browse the links mentioned above to download Mahalaya Mp3 Song Mahisasur Mardini of Birendra Krishna Bhadra for free and lets celebrate Durga Puja. Search Tags: Free Download Mp3 Songs Mahalaya, Durga Puja Songs download Mahisasura Mardini, Ya Devi Durga Stotra mantra download Mahalaya Birendra Krishna Bhadra download.